Jason Mraz delights fans inside The Venetian Theatre at INSPIRE. Jason Mraz and bandmates met with youth from the two INSPIRE charity beneficiaries after performing an Underground Lounge acoustic session at radio station Mix 94.1. 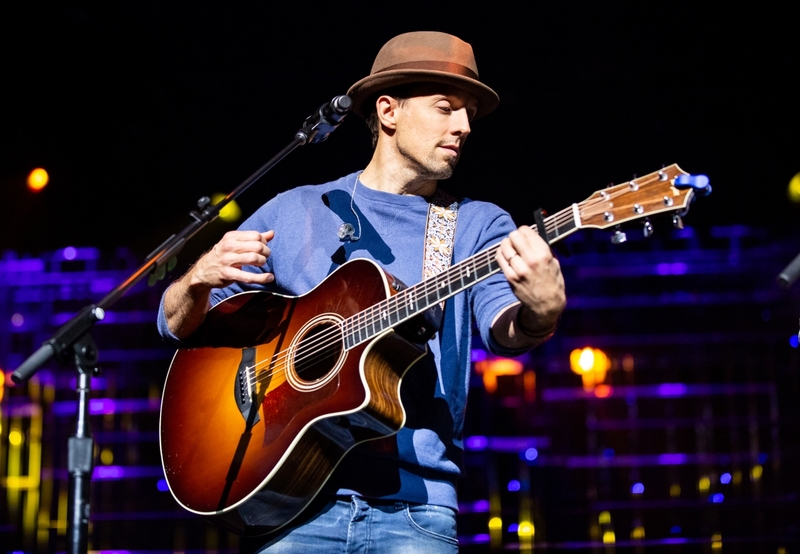 Las Vegas, NV, July 9, 2018 /3BL Media/ -- The second annual INSPIRE charity concert brought in Jason Mraz fans and charity supporters from across the country to raise funds for Sands Cares Accelerator Program members: the Marty Hennessy Inspiring Children Foundation (ICF) and Nevada Partnership for Homeless Youth (NPHY). Both organizations work to assist at-risk youth in providing guidance, building life skills, providing housing, support, and more. Mraz visited with youth from each organization during an “Underground Lounge” acoustic performance at local Las Vegas radio station Mix 94.1. For some youth, it was their first time to ever attend a concert or meet a musical artist. “My favorite part was being able to meet him face to face. That is a once in a lifetime experience. I couldn’t believe it. Being able to meet him and go to his concert…the whole thing was just amazing,” said a Nevada Partnership for Homeless Youth client. INSPIRE began with a VIP cocktail reception and silent auction at the Venetian Theatre, including an exclusive “Meet and Greet” session with Jason Mraz. ICF, NPHY and Sands Cares volunteers helped orchestrate the pre-show festivities. Proceeds from INSPIRE 2018 delivered more than $200,000 to help fund programs for Accelerator program members and their missions to serve at-risk youth in Southern Nevada. Beyond the fund-raising impact for ICF and NPHY, the two organizations credited INSPIRE with giving their youth opportunities for new experiences, exposing the organizations to new donors, and helping them increase awareness about their impact and services to the community. Sands Cares, the company’s global corporate giving and community engagement program, presents INSPIRE annually as its signature fundraising event for the Accelerator Program. This community partnership offers a longer-term investment in select nonprofit organizations who are invited into the program based on their potential to expand service and grow in size with the resources of a committed corporate catalyst in Las Vegas Sands. The Marty Hennessy Inspiring Children Foundation (ICF) was named the first member of Las Vegas Sands’ Sands Cares Accelerator Program. Their mission is to take at-risk youth off the streets and into greatness by providing them with life-changing opportunities. Nevada Partnership for Homeless Youth (NPHY) joins ICF as the second official member of the program. NPHY provides Southern Nevada’s homeless youth with help, hope and opportunities to rebuild their lives, guiding them toward a path of self-sufficiency with access to services including outreach, emergency shelter, independent living, and other programs to assist their transition out of homelessness. Each member is committed to the Accelerator Program for three years.